The above image shows an A10 Mk1 power amplifier. Today, the control marked “balance” might cause some confusion as we tend to associate this with a stereo balance control used to adjust the relative volumes of the left and right channel. The A10 was, of course, a mono amplifier. The balance control was used to adjust the relative bias currents in the pair of output valves used. To obtain minimum distortion and maximum peak power it is desirable to ensure that the two output valves draw similar currents, so this control could be used to balance (equalise) these in order to optimise performance. For a design released in 1954 the specification of the A10 Mk 1 was quite impressive, giving up to 10 Watts with a distortion of no more than 0.1%. Harold Leak made a great deal of publicity for his company's products by adverting levels of distortion this low. 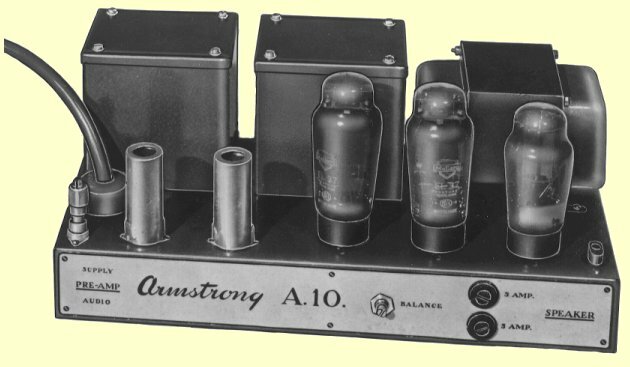 However, although the performance of Armstrong amplifiers were similar, Armstrong tended to promote their equipment in terms of reliability and competitive pricing. The picture above shows the A10 Mk 1 control unit. 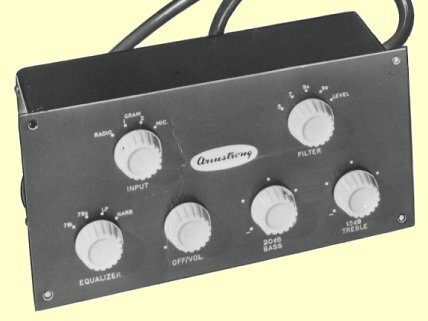 Later models of this pre-amplifier were produced with minor styling changes. For example, in this early photo the control knobs are white. Later on these were replaced with gold-trimmed, coloured knobs. Eventually, the unit was restyled with a white fascia that matched the PCU21/27 series of control units that appear in later years. Note that in the early 1950's it was common for high performance control units to offer a wide range of filtering and ‘equalisation’ settings. Many early LPs (and of course 78's!) had poor HF response, and when played with many of the cartridges and arms that were then available, could produce high levels of distortion at high frequency. AM radio broadcasts were also subject to quite a lot of interference, producing various unwanted whisles, etc. To cope with this, treble filters were routinely used. The control unit also provided a ‘notch’ filter that could be used to null out whistles at 8kHz which were commonly produced by the carriers of radio stations in adjacent channels ‘beating’. The variety of equalisation curves was because at that time the various record manufacturers had not adopted a common standard for the equalisation used for recording. Hence you would need to select the curve required for records produced by the company who had made the record you were playing! The companies standardised at a later date on the equalisation curve that has become generally known as the ‘RIAA’ (Radio Industries Association of America) curve. The same standard was adopted in the UK under BS1928/1955. The A10 Mk 1 control unit provided inputs for: microphone (10 - 100mV), pickup 1 (15 - 100 mV), pickup 2 (70 - 150 mV), and radio (50 - 150mV). There was a 4-position equalisation selector that provided the 78A, 78B, LP, and NARTB curves. The filter control could select four different low-pass bandwidths. Bass and treble controls were provided along with a volume control, and there was an HT output provided to power a valve tuner. The electronics for the A10 Mk 1 and its control unit were designed by George Tillett. George left Armstrong in the mid 1950's and then did design work for various other companies, including DECCA. 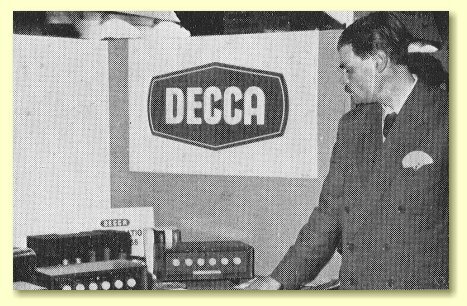 The picture to the left shows George at an audio show in London during the late 1950's beside equipment he designed. During the late 1950's and early 1960's he also wrote a number of articles for Hi Fi News magazine and the Hi Fi Yearbook — for example on amplifiers in the 1956 and 1961 Yearbooks. Later on, he emigrated to the USA and at one time he edited one of the American audio magazines. Click on the logo to return to the home page.